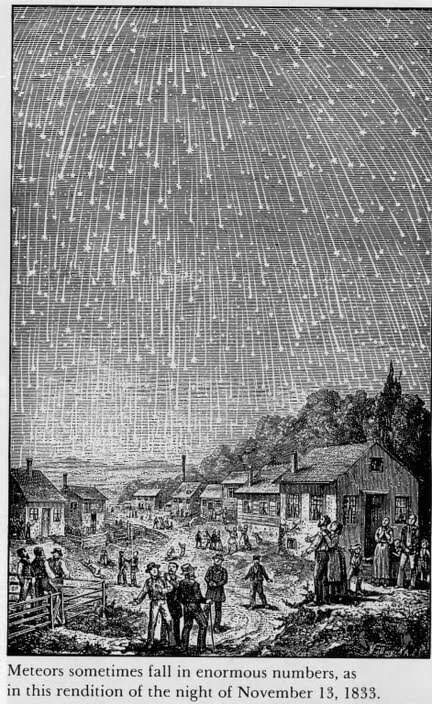 November 12-13 in 1833 was the date of the Leonid meteor shower. The best vantage point to see the shower seemed to be in Alabama. 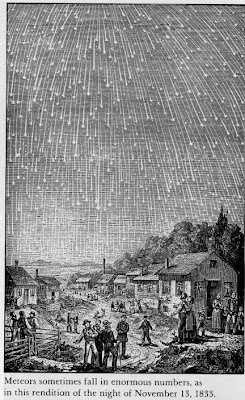 Over the course of two nights, luminous stars streaked the skies over Alabama at a rate of 30,000 meteors an hour. It is known as the night the stars fell on Alabama. Many people were convinced it was the end of the world. Needless to say the event left its mark in story and song... and alcoholic beverages. Later the same year, Mitchell Parish and Frank Perkins wrote a song of the same name. Stars Fell on Alabama was recorded by Guy Lombardo's Orchestra. Subsequent recordings have proliferated with everyone from Billie Holiday to Jimmy Buffett recording their versions. Stir briskly and strain into a chilled coupe. A couple of these and stars won't be the only thing falling! 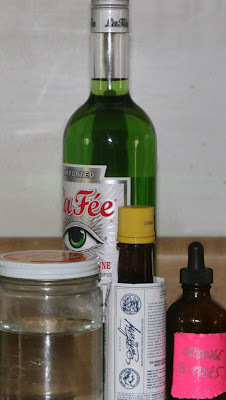 Those of you who live in Alabama, or West Virginia for that matter might have a reliable source for authentic corn whiskey, but some may have to find a more commercial source like Pioneer Spirits. Do refrain from buying anything in a Mason jar with "cute" spellings. As always, be very careful around the burn pit when toting corn liquor and absinthe! And since vintage cocktail books are so terribly EXPENSIVE, if you have a copy of So Red The Nose you want to add to my library, I'll be happy to take it off your hands. Now that is some story. Thank you, I always sing that song and now I too have a story. Cocktails at the Burn Pit -- The Teddy "Bear"